Serving the Bakersfield area 24 hours a day 7 days a week. Call us at (661) 829-3060 or send us a request for a quote with the issues you are having. 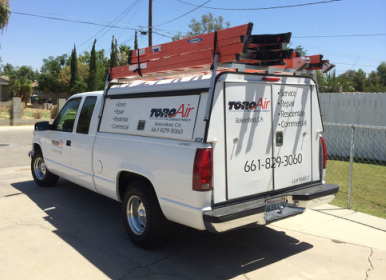 Toro Air serves its customers with the highest level of skill and service. We provide affordable Air conditioning and Heating Repairs for residential and commercial use. With expert service technicians we have the experience, skills and tools to fix any HVAC problems the first time. We specialize on chillers, refrigeration, Heating & Cooling, Air conditioning repair & service, Ventilation, boilers, unit replacement, unit installation, thermostats and more. Our attention to safety and professionalism makes us head and shoulder above the best! Toro Air Conditioning & Heating Inc.